Soudal PU foams are one-component, easy-to-use PU foams that are applied either through PU foam guns (gun foams) or through included manual straw applicators (straw foams). Once extruded from the applicator, PU foams expand in size through reactions with moisture in the environment. When fully cured, PU foams are semi-rigid with resistance to water and chemicals, making them an ideal product for sealing and filling large voids and gaps with a requirement of durability. Fully-cured PU foam is made of millions of tiny cells – these cell structures give foams excellent insulation properties, and make PU foams a superb product for applications where thermal and acoustic insulation of the gap filler is desired, such as for the filling of gaps between wall and window-frame. Its self-expansion properties make Soudal PU foams a high-value proposition. Each 750 ml can of foam can achieve up to 60 litres of cured foam. All PU foams need to achieve a delicate balance between density, yield, and strength. Too dense, and you have poor insulation and poor yield, bringing poor value. Not dense enough, and your foams face a risk of collapsing and having poor durability. Soudal’s answer to the problem? Open-cell PU foam technology. Many manufacturers can easily make a closed-cell PU foam, which explains why all the foams out there are low on yield and of very high density. Achieving a right open-cell formulation takes years of work and research to perfect, because it’s such a delicate process. As a world leader in PU foams and its related technologies, Soudal has developed its proprietary formulations and manufacturing processes to fully implement open cells in its PU foam products. The result? A very strong PU foam that combines medium density with open cells that strikes all the right balances in achieving high yield, high strength, and high durability. Besides increasing yield, open-cell technology brings about many advantages, such as controlled expansion, quicker curing, increased stability, and a very fine and uniform cell structure. This is the most simple calculation to derive the value of a PU foam. Yield is the figure of cured foam that can be extruded from a can. A higher yield means you can fill more joints and fill more gaps with each can. In our testing, Soudal foams can outperform competitor foams by more than 30% solely in terms of yield. This means that you require 30% less products to do the same application. This also means that at the same price, Soudal foams are up to 30% cheaper than other brands. Soudal foams achieve their high yield through the combination of lowering density and opening cells, delivering a product of unmatched value. Joints are always the weak link in a building’s insulation. What’s the use of installing an expensive double-glazed window, when you fill the window joints with cement? Cement has thermal conductivity of 0.29 W/mk. PU foam? 0.03 W/mk. A lower figure means better insulation. Do the math. Many people have the misconception that thermal insulation is only important for cold countries, where the disparity of indoor and outdoor temperatures may reach as much as 30 degrees Celsius. But not many realize how much energy can be saved on air-conditioning in a hot country like Singapore, simply by using high-insulation building materials. Why? It takes much more energy to cool a room, than to heat it up. If you need an explanation, just begin by thinking about how easy it is to create heat with electricity – all you need is some resistance. Cooling a room can cost three times as much as heating a room. Also, it’s not just about thermal insulation. In today’s cities with its never-ending bustle and traffic, a little silence at home and in the office is a prized commodity. PU foam has acoustic insulation of more than 50 dB, as compared to mineral wool, itself a good insulator but only managing 40 dB of sound insulation. Insulation even differs between foams. Soudal foams, with its medium density, open cells, and uniform cell structure will ensure the best insulation properties for your applications. Many foam manufacturer boast about their high expansion properties. Soudal is different. Immediately after extrusion, Soudal foams have what we term “controlled expansion”. This means that sweet spot of having enough expansion to fill a gap, and yet not too much expansion that ends up being cut away as wastage. This is in contrast to many other foams which expand uncontrollably out of a joint, and users are often left with a lot of guesswork of how much of the joint to fill to minimize wastage. With Soudal, it’s simple. Accurate dosing is key – our foams will expand, but not so much that it all ends up in the trash. Soudal PU foams use its open cells and controlled expansion to limit the curing pressure and to stabilize its structure, so it fills your joints, not bend them. Products with poor dimensional stability can create excessive curing pressure in the process of expansion, or even continue to expand for days after curing (also called post-expansion). These can lead to problems with warping and bending building materials out of shape, which in turn can cause more problems. Ever experienced a door that was very difficult to open and close? Could be a poor quality foam. Small problem, but very annoying. 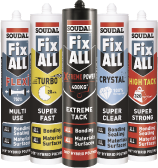 Soudal products are extremely stable, both during curing and after curing, and will never develop excessive pressure, nor have problems with post-expansion, all thanks to Soudal’s proprietary formulations. Soudal PU foams are convenient, one-component products that are easily dispensed with minimal need for any hardware. In particular, the straw-type foams do not require any additional accessories at all. Gun-type foams only need an extra PU foam gun and a cleaner, with minimal maintenance required. This means no need for any mixing – just pull the trigger, and the foam comes out in a well-structured froth – and you can leave it to expand by itself. This is unlike mortar grouts which require mixing with water (best done with a machine), and applied using dirty and dusty methods which also requires heavy equipment. It is also not just the application – mortar grout and cement is heavy and requires significant manpower to move around, and gives you much less yield. A typical mortar grout yields roughly 15 litres for every 25 kg sack. PU foam? One 750 ml can (with a weight of less than 1 kg) can create up to 60 litres of foam. PU foams are very sensitive, even before extrusion. The stability of the foam refers to how long a product can be kept, and how much degradation occurs over time. Soudal foams are formulated to be chemically stable within the can for a longer period of time, and aged cans of Soudal PU foam can deliver significantly better quality than comparable competitor products. Soudal has also invested considerable time and effort in creating the best canister design with its valve and nozzle systems. No ups and downs. Only ups. Being a world-class company with products used in over 150 countries, Soudal depends on its products to uphold its reputation for quality. We take pride in the consistency of our products, whether in the simple things such as accurate and truthful filling (750 ml means 750 ml), or in more complicated affairs such as testing and controlling the quality of raw materials and end-products. Every can is checked with automatic processes and machinery to contain the correct amount of pre-polymers, and we do extensive quality controls to ensure that every can is a can you can count on. More or less – we’ve got you covered. Soudal foams are available both in handheld, manual applicator versions (we also call them “straw foams”), and versions requiring a separate PU foam gun (we call them “gun foams”). Using a gun gives a better yield and generally better properties, at a slightly higher cost. Handheld foams are good for convenient, immediate usage with lower requirements. Both are world-class, exceptional-quality products. For fire-rated applications, we have our Soudafoam FR, a PU foam with test reports that boasts a fire-rating of up to 6 hours. Extensively tested with reports from international organizations such as ETA (European Organization for Technical Approvals), ift Rosenheim GmbH, Branz, and CSTB (Centre Scientifique Et Technique Du Batiment), corresponding to standards such as EN ISO 10140-1:2010, EN ISO 717-1:2013, AS 1530.4-1997, AS 4072/1-1992, and ETA 13/0280. Products are only as good as their production, which is why we insist on manufacturing every single can of PU foam in our state-of-the-art production plant in Belgium. Utilizing tested-and-proven raw materials based on our proprietary formulas, and producing only on highly efficient, automated machines ensures that every single can is of the highest quality. Combine that with our stringent quality checks and controls, and you have a product you know you can count on each time, every time. High-yield PU foam with included straw applicator for quick, easy, and convenient application to fill gaps, cavities, and joints. Self-expanding with superb filling properties. Professional gun-applied PU foam which allows for very precise applications. Especially designed for larger projects. Fitted with regular threaded adapter for foam guns. Fire-rated PU foam for applications where fire-rated characteristics are required. Fire-rating of up to 360 minutes, with international test reports and certificates available. Cleans and partially dissolves fresh and uncured PU foam and foam stains. Also for the cleaning and maintenance of PU foam guns. Fitted with regular threaded adapter for foam guns, and includes spray attachment. High quality, lightweight PU foam gun for professional applications requiring precise dosing and best cell structure. A PU foam gun is required for application of Gun-type PU foams, such as Soudafoam Gun. Made in EU.